Xiaomi Mi MIX 2S Leaked Photo Shows Vertical Dual Cameras - Playfuldroid! A leaked image of the alleged Xiaomi MI MIX 2S has appeared on Weibo. It reveals that compared to the first and second-generation Mi MIX models, the upcoming MIX 2S will be sporting a different design for the back panel. 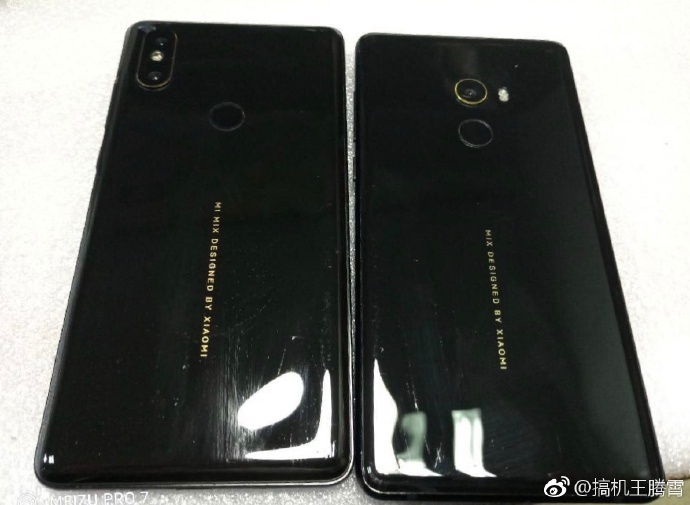 The image shows that the alleged Mi MIX 2S is placed alongside the original Mi MIX concept phone or Mi MIX 2. The vertical dual camera setup present on the Mi MIX 2S seems to be inspired from the iPhone X. The LED flash is positioned in between the two camera sensors. It reveals that the positioning of the rear-mounted fingerprint scanner is almost same as predecessor models. The first and second-generation phones have “MIX Designed by Xiaomi” text present on the rear panel. However, the Mi MIX 2S has “Mi MIX Designed by Xiaomi” text. The reflective appearance of the MI MIX 2S indicates that it may feature a ceramic body like the predecessor phone. Recent reports have suggested that the MI MIX 2S will be coming with an under-display fingerprint scanner. If this information is true, then the new image could be a prototype of the Mi MIX 2S. There is no confirmation on the authenticity of the above image. Hence, it is advised to digest this report with a pinch of salt. Two Independent Cameras For Xiaomi Mi MIX 2S?